Extremadura - an autonomous community of Spain. 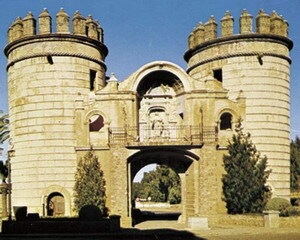 It includes the provinces of Cáceres and Badajoz. Some important cities are Cáceres, Badajoz, Plasencia and Mérida, the capital of the autonomous community. Extremadura borders Portugal to the west. It is an important area for wildlife, particularly with the major reserve at Monfragüe. Badajoz and Cáceres are, respectively, the largest and second-largest provinces of Spain. The area contains some fascinating Roman ruins, especially at Mérida. Extremadura is located between Portugal and Madrid and is regarded as the best kept secret of the country Spain. This terrain is absolutely a rich natural glory that has all the ingredients of unspoilt cultural and natural heritage. The cities' cultural and historical heritage is the legacy of numerous civilizations that lived in the Iberian civilizations. Buy at AllPosters.com One can have lively experience of festivals, enjoy local traditions and gastronomy that have survived here for centuries and are still integral part of everyday life. Be it hospitality or tourism amenities, all is well done that make the entire vacations a spellbound experience. The setting of Extremadura, Spain on the Portuguese border makes it a special place for families and couples to come and rent self catering villas, plenty with pools to cool off in the heat of the summer. The picturesque locations and historical monuments will transform the entire trip into a pleasant experience. This is all because Extremadura is land with plenty of natural landscapes, lakes and rivers. Some of the eminent and often visited attractions include Monfrague, Cornalvo, La Raya and Merida among others. All these sites have been crowned by UNESCO with the title of world heritage sites and that is why grab attention worldwide. Extremadura is simply an exotic place for activities like bird watching as we can have close up views of bird populations such as black strokes, great bustards, black storks, vultures and imperial eagles. One can even never forget to mention about the hundreds of cranes arriving from Scandinavia every winter. That is why if you want to have awesome bird views, nothing can be called better place than Extremadura. As far as gastronomy is concerned, the quality of gastronomy available in Extremadura is excellent. That is why it has special place in the list of itinerary of this nation and vacationers traveling here are always excited to enjoy it. And when we talk about food, this region is specially recognized for its delightful cuisines. The best art of the food prepared here is that it is kept healthy and natural as people in Extremadura are far more concerned about their health and fitness. We can also get excellent cheese, lambs and beef that are mouthwatering. You can also enjoy food prepared with red wine, white wine, paprika, honey and olive oil. In fact, it is said, Extremadura is a region where the latest traditions and cultural traditions are blended in a beautiful mix that can captivate the hearts of travelers in a blissful way. Extremadura is world known for holding events in the areas of literature, cinema, theatre, folklore and music and the best part is that these events are organized in the ambience of historic centers, castles and arched squares of town. Some of the popular festivals and events are festival Womad, Spanish festival of music, La conversion Hebrea, street festival of theatres, flamenco week, folk festival, Caceres theatre festival, international festival for folk, estivalia and plasencia festival for folk culture. If you are interested in horse riding, this place can provide you distinguish pleasure as the horses are well trained for the purpose of riding and they even show hospitality to a great extent. So, if you are looking forward to have rocking time during vacations, Extremadura, Spain can definitely be your cup of tea. There is a great selection of holiday villas and houses for rental in the Extremadera region of Spain that make it a great area for families wanting to rent in which to explore the beauty and culture of this area of Spain. Extremadura is located in southwest Spain bordering Portugal and the regions of Castilla & Leon, Castilla La Mancha and Andalucia. It consists of the two provinces Badajoz and Caceres, which are respectively the largest and second-largest provinces in Spain. Extremadura is the poorest region in Spain and is also one of the least visited. It is also one of the most beautiful with a landscape consisting of plains, mountains, meadows of cork oaks and fields of stone and lime. Many of the famous Spanish conquerors (Conquistadors) were born here who later went on to settle in America naming many of the new cities with those from towns in Extremadura. Merida is in the province of Badajoz and was founded by the Romans in 25 BC to become the capital of their western province of Lusitania. It lies at the Roman crossroads that link Toledo with Lisbon and Salamanca with Seville. Merida has one of the most outstanding collections of Roman monuments in Europe. The most incredible is the Roman Theatre with a magnificent colonnaded stage wall and a capacity for up to 6,000 people. During the summer months, the theatre is often used for drama productions and festivals. By the side of the Theatre can be found a remarkable elliptical Roman Amphitheatre. It had the capacity to hold up to 15,000 spectators who were entertained with chariot races and gladiatorial contests of strength. At times the arena was even flooded for re-enactments of victorious sea battles. Located just over the road is the National Museum of Roman Art, a modern building that contains beautiful collections of Roman sculptures, artefacts, paintings, locally minted coins and mosaics. Badajoz is the largest province in Spain and is bordered by the provinces of Caceres, Cordoba, Seville, Ciudad Real, and Huelva. The landscape throughout the region appears quite desolate with slightly undulating hills and vast open spaces. It has one large river called the Guadiana, which traverses the north of the province from east to west. Most of the year the river can be crossed quite easily as only at certain times does the river swell to cover the riverbed. The climate in Badajoz region varies between fiercely hot during the summer months and extreme cold in the winter. The Main Square (Plaza Major) is the best place to start in Caceres from which to explore the labyrinth of streets that are lined with imposing buildings. Passing through the old city walls via the Arco de la Estrella (Star Arch) can be found Plaza de Santa Maria where the Cathedral de Santa Maria can be found. The cathedral is Gothic in design, and this is where many of the Conquistadors are buried. There are many grand looking palaces situated around the Plaza and some of the most appealing shops in Caceres can be found on the streets radiating out. Further up the hill on Plaza de las Veletas, can be found the Museo de Caceres (City Museum). The Museum contains a wonderful collection of prehistoric and Roman artefacts, along with a 17th century Arab Cistern with a preserved baroque facade. Also on this square is the Palacio de la Cigüeñas (House of the Storks) distinguished by it's tower. On top of many rooftops and bell towers in Caceres can be seen many storks nests who have for many years made the city their home too.